This theme is built upon Bootstrap 3.2.0 framework. The template is very powerful, clean and fast, easy to customize and use. In downloaded package you will find Less files that enables you customize the template quickly. Less is used only for theme generation. The template is based on 1170 px grid system, using the latest HTML5 and CSS3 technologies allows to make changes in the page structure of the template. PSD file is included in the download package. Well organized and comment codes so it’s very easy to customize and use in your project according to your needs. Amazing theme options also help you to make your showcase cool, stylish and individual. 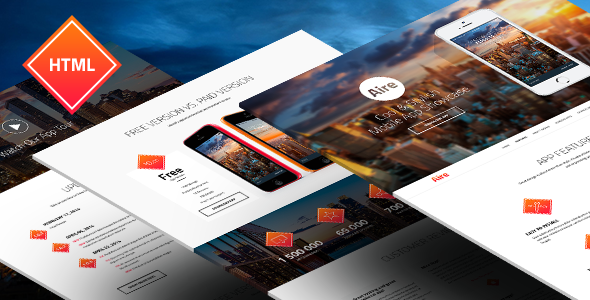 Item Reviewed: Aire - App Landing Page HTML5/Less Template 9 out of 10 based on 10 ratings. 9 user reviews.